Myelodysplastic syndrome (MDS) is a family of clonal haematopoietic stem cells disorders characterized by dysplasia, ineffective hematopoiesis and susceptibility to transformation to Acute Myeloblastic Leukaemia (AML) that are shown to be strikingly refractory to current therapeutic modalities. The first chapter of this book provides a detailed review of the risk factors, treatment options and prognosis of MDS. Chapter two studies the inflammatory and autoimmune nature of MDS. Chapter three discusses the pathogenesis of 5q-syndrome. Chapter four examines the genetic mutations identified in MDS and their significance. Chapter five reviews different prognostic factors and stratifications of risk in Argentinean patients with MDS. Chapter six discusses epigenetics and epigenetic therapy. Chapter seven introduces mild oral chemotherapy treatments for elderly patients with a higher-risk myelodyspastic syndrome. 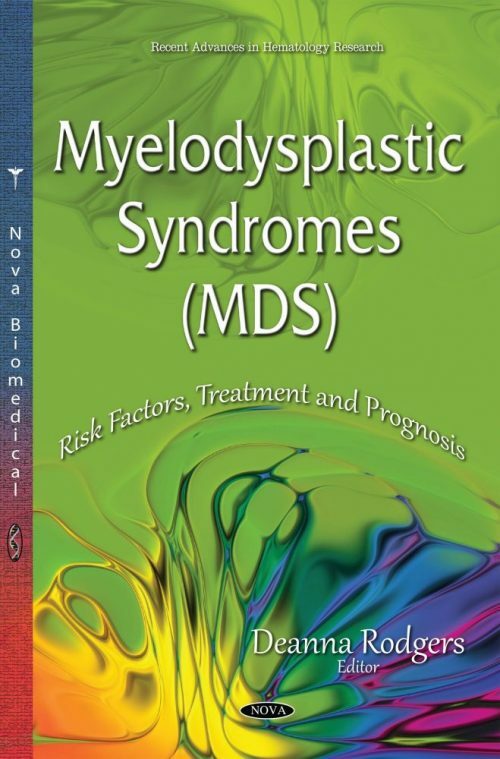 Chapter eight discusses lenalidomide treatment in lower risk myelodysplastic syndromes. Chapter nine analyzes the old and new-integrating prognostic models and mutational advances with epigenetic and cellular therapies for MDS. The last chapter studies the entropy evaluation of bone marrow biopsies in MDS.